When Cam-Am brought out the original Maverick UTVs as a way to compete with the Polaris RZR, we were impressed. 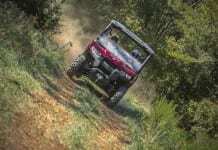 They have always been fun, capable machines that sparred with the Polaris units for tops in the performance arena. 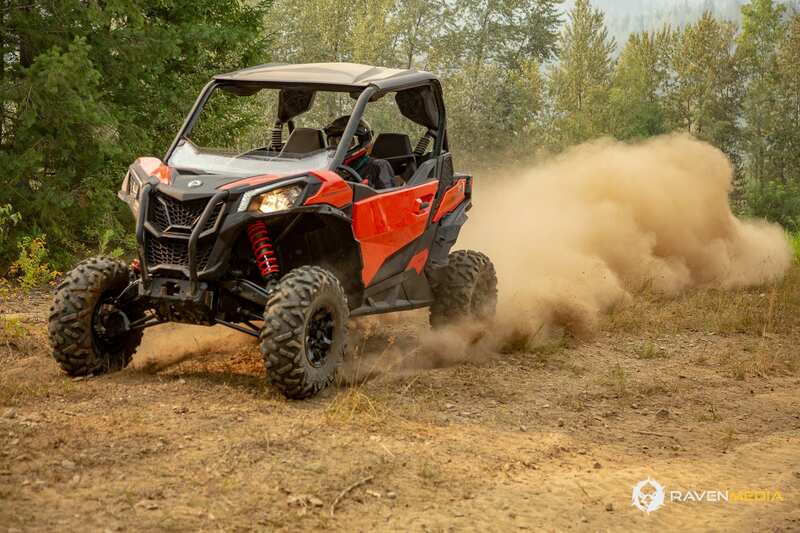 When Can-Am stepped things up even more with the Maverick X3 machines, the extreme performance action really heated up. These 64- to 72-inch wide machines brought horsepower and suspension and smiles to our faces whenever we drove one. So, last year, when Can-Am teased us with a new UTV, with some woods in the background, we had high hopes for something that combined elements from the X3, with something for the woods. We were not disappointed. The Maverick Trail is an awesome machine and remains one of our favorite units. Still, we suspected Can-Am was still working on something. We were right. It’s kind of funny, actually. We sat around with some other off-road journalists from around North America at the Maverick Trail intro and all pondered if we thought Can-Am would make a version of the Trail in a 60-inch wide machine. Of course, they did – the new Maverick Sport. 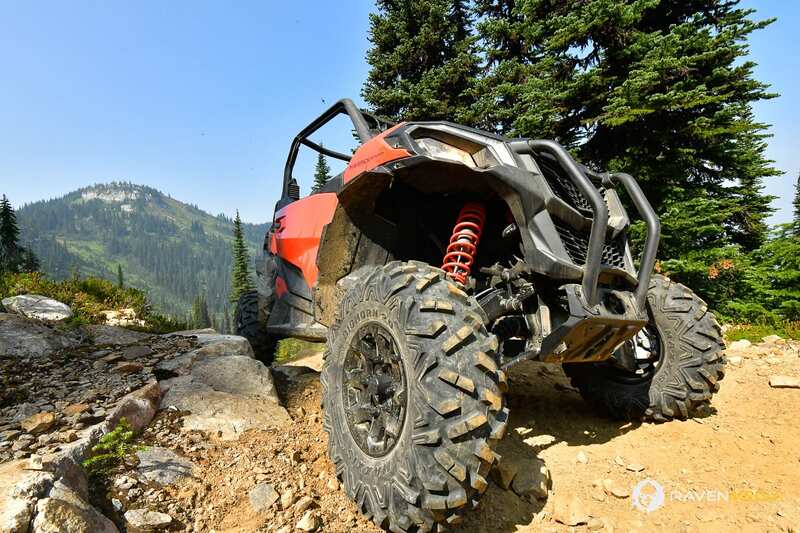 The Maverick Sport is not the same machine as the Maverick Trail with some wider A-arms. Yes, some of the machine is the same, but the Sport is its own machine. There are technically three Maverick Sport models. The base Sport 1000 without power steering, the Sport 1000 DPS with power steering and the 1000R DPS. All three are powered by the same 976cc Rotax V-Twin engine. The base model and the 1000 DPS engine it tuned to produce 75hp. Our favorite model, the 1000R, pumps out 100hp and is a whole lot of fun. If you want to know how Can-Am gets an extra 25hp into the 1000R, look at the X3. Both the 1000 and the 1000R come with large air intakes, oversized radiators and Donaldson airboxes. However, the 1000R uses the larger airbox found in the Maverick X3, a specialized high-performance exhaust line and muffler, an additional CVT intake and the same CVT driven pulley the Maverick X3 utilizes. Driving the two machines back to back is crazy. Both handle great and have lots of power, but you REALLY feel that extra 25 horsepower. It’s crazy fun! For very tight trails, there are 50-inch machines for that market. The 60-inch wide machines handle tight trails and have the stability we crave for faster driving and having fun. 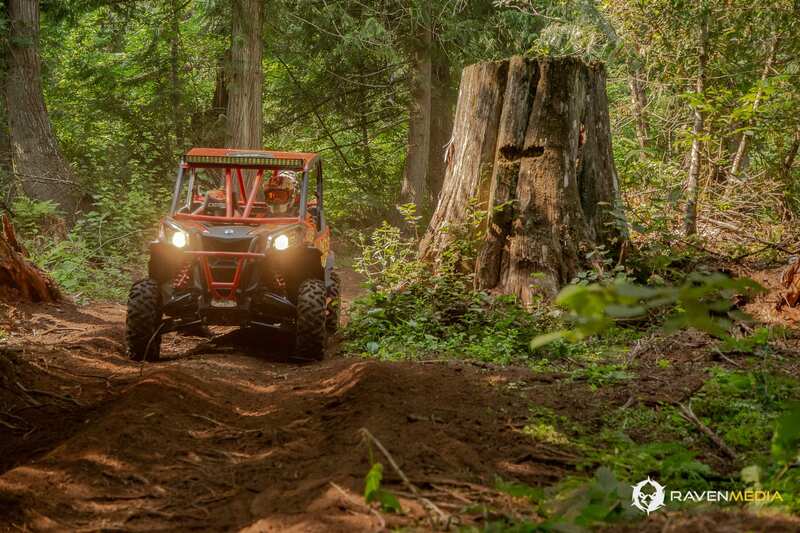 When Can-Am introduced us to the Maverick Trail late last year, we were all into it. They made a great handling machine using a longer wheelbase to gain stability. It also has excellent handling and suspension along with a powerful motor to make it serious fun. There was enough DNA from the Maverick X3 line to show the direction things were headed. The Maverick Sport takes everything we love about the Trail and expands on it. What we love about the Maverick Trail is the superb handling. 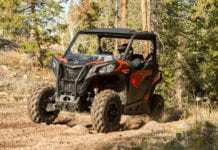 The competition in the 50-inch category, Textron and Polaris, had been put on notice that a new benchmark was set for the class. Is that going to be the same for the 60-inch category? That could very well be. As much as we love the Trail, the handling in the Maverick Sport is amazing as well. The Sport’s frame has the same 90.6-in. wheelbase as the Maverick Trail. The basic frame is the same between the two machines, with subtle differences. The long wheelbase keeps you planted on the roughest, nastiest terrain, and when you take in the 60-inch width, you have an incredibly stable machine. For suspension, the Maverick Sport use double A-Arms up front and Torsional Trailing Arm (TTA) rear suspension. Can-Am wisely choose FOX 2.0 Podium shocks with the front having 11.5-inches of travel and the rear shocks running 12-inches of travel. One of the things people notice right away about the Trail is the positioning of the rear shocks. Like the Trail, the Sport positions the rear shocks at the outermost corners of the machine. This reduces the load on the rear of the machine and gives the chassis more stability. There are sway bars built into the front and rear suspension systems. Suspension action is outstanding. It is easily the most forgiving machine we have driven in a while, and that says something. We hit everything from hard pack trails, to heavily rutted trails, hard-core rock-infested inclines, wide-open grass tracks and more. It doesn’t matter what we throw at the Sport, it handles it. The combination of the long wheelbase, great suspension action and power will pull you right through everything with relative ease. The nastier the terrain, the harder you can go and the better the machine responds. This was something we really liked about the Maverick Trail, and in the Sport, we like it even more. If this is a sign of the direction Can-Am is going, we are excited. 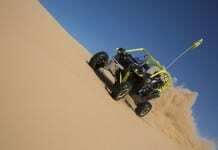 Good things are ahead for us as UTV enthusiasts. Ergo-Lok is the term Can-Am coined to describe the ergonomics of the cockpit area of the current crop of Maverick machines. Sit in one of the machines, and you’ll notice how the positioning is slightly reclined. It can take a little getting used to. The cockpit of the Sport is 5.5-inches wider than the Trail, which doesn’t sound like a lot, but it is. The machine is very comfortable behind the wheel, and you feel very confident feel. The driver/passenger positioning combined with the excellent weight transfer from the front to back adds to the outstanding handling. The driver controls are arranged very well too. We have to talk about the Maverick Sport doors, too. Can-Am designed an all-new full half-door with really great handles. The protection from the trail including rocks and mud is excellent, and thanks to the handles, getting in and out is super easy. So often, when we see a marketing campaign built around a new machine, there is a certain amount of “fluff” that we all know to immediately sort through. Like with most of the stuff they produce, Can-Am went a little different route. Three words Can-Am uses to describe the Maverick Sport – daring, precise and confident. What can we say, it isn’t fluff, it fits very well. How the machine handles inspires a lot of confidence. It goes where you point it and the suspension and steering is very precise. The 1000R engine lets you go as fast as you would dare and the 1000 doesn’t leave you wanting. 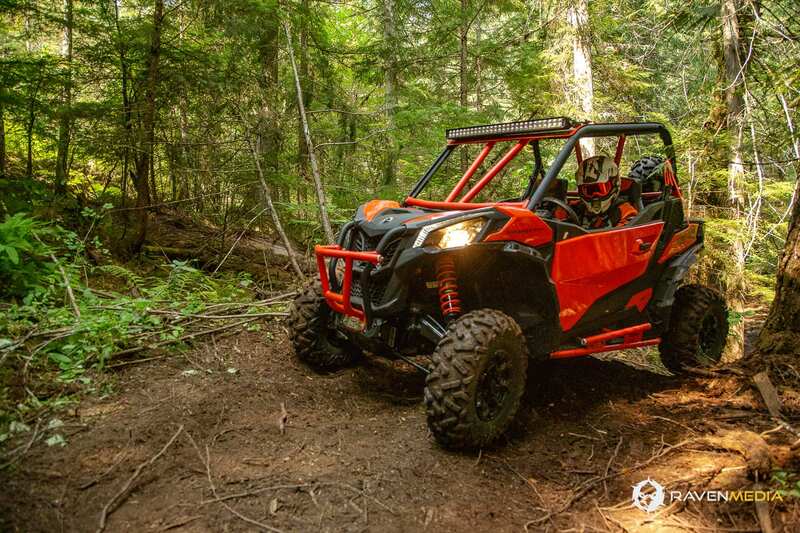 For the introduction of the Maverick Sport, We traveled to the other side of Canada to British Columbia to the Carl Kuster Mountain Park (CKMP) near Sicamous, BC. Carl Kuster is a former champion snowcross racer and runs a specialized riding destination that complimented the idea of daring, precise and confident. 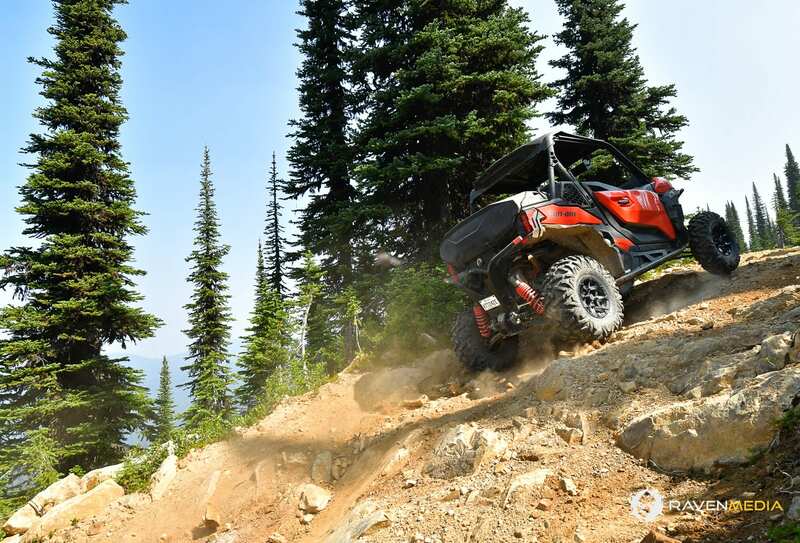 For the initial ride, we went up into the Monashee Mountains and put the Maverick Sport to the test. 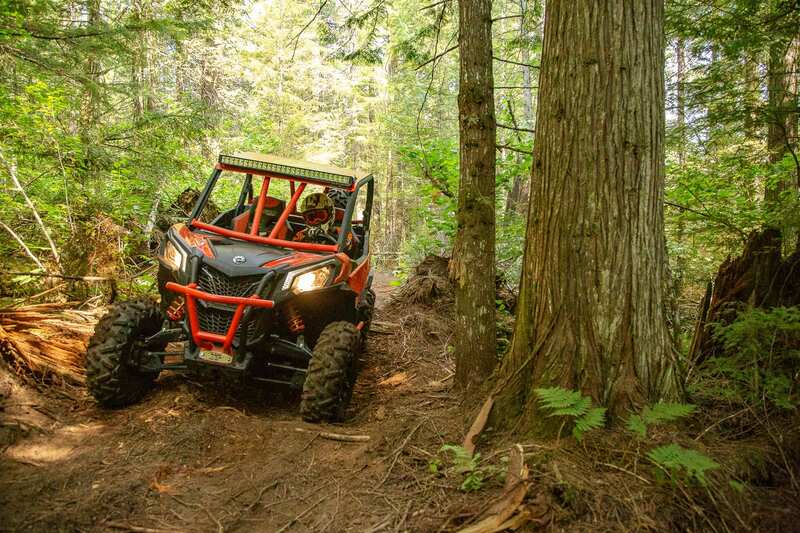 On the second day, we hammered through some smaller trail loops that Can-Am had set up that included a grass track, a hard-core woods loop, some additional winding trails, and some flat-out, drag strip-style riding. It was so much fun, and the prefect introduction to the Maverick Sport. Finding faults with machines we really like is hard, but we if we didn’t talk about things that need to be pointed out, we wouldn’t be doing our jobs. The weak link for the Maverick Sport is one that it shares with the Trail. The rear cargo area leaves your stuff open to getting dirty and muddy from the rear tires. With the limited rear fender area, and the shape of the body overall, along with the tires being placed far to the rear corners, it lets mud and dirt get up on the rear cargo area. If you buy a Maverick Sport, you should consider extended mud guards, or a cargo box to keep your gear from getting completely filthy. Honestly, we had to wonder why Can-Am is offering a non-power steering option. Yeah, it does get the machine out there at a lower price point, but still. Maybe we’re wrong and there are probably folks out there that don’t want power steering. We’re not those people, though. You can only get the 75-horsepower motor with the non-power steering version, and our guess is, Can-Am won’t sell very many of them, and probably are only producing a limited amount. Speaking of power steering, the Can-Am Dynamic Power Steering is pretty sweet. At lower speeds, it is stronger to reduce bump steer and aid in handling. At higher speeds, the power steering backs off to give you more feedback as you haul across the terrain. This helps you maintain control and react to the trail as it unfolds in front of you. 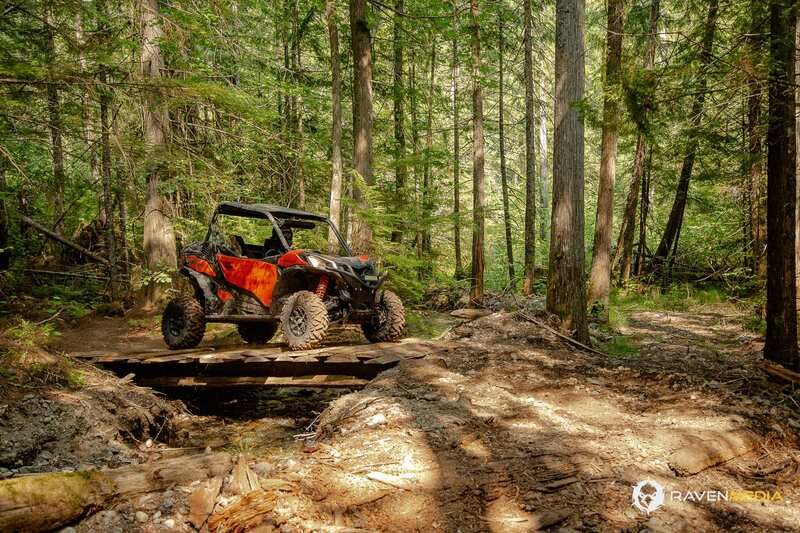 Ground clearance on the Maverick Sport is 12 inches which helps you float over trail obstacles. Can-Am added injected skid plates along the whole underbody. We hammered up a severely rocky trail that had some rather large and jagged rocks on it. It was nice to have full confidence that the machine was capable of handling this type of terrain and not leave us stranded with a mechanical due to an impact. 27-inch Maxxis Bighorn 2.0 tires helped that too. You bet it is! Can-Am once again knocked it out of the park. We can’t wait to spend more time behind the wheel of one and the ideas for a build project are flowing already. If you’re in the market for a 60-inch UTV and want to have superb handling and suspension, and who wouldn’t, you need to check out the 2019 Can-Am Maverick Sport.